Did I ever tell you I was lucky? I have the good fortune to live at the end of pennisula which is bordered to east by the River Mersey estuary and to the west by the Welsh Dee estuary and saltmarshes. The food rich mud and sands attracts big flocks of many wader species which spend the winter probing the shoreline. Huge flocks of many thousand knot wheel and flash in the low winter sun as they fly in tight formation to escape the attentions of peregrines. Large groups of sanderling run the surf line in synchronised union. Curlew probe around rocks looking for small crabs to snap up in the elegantly curved bills. 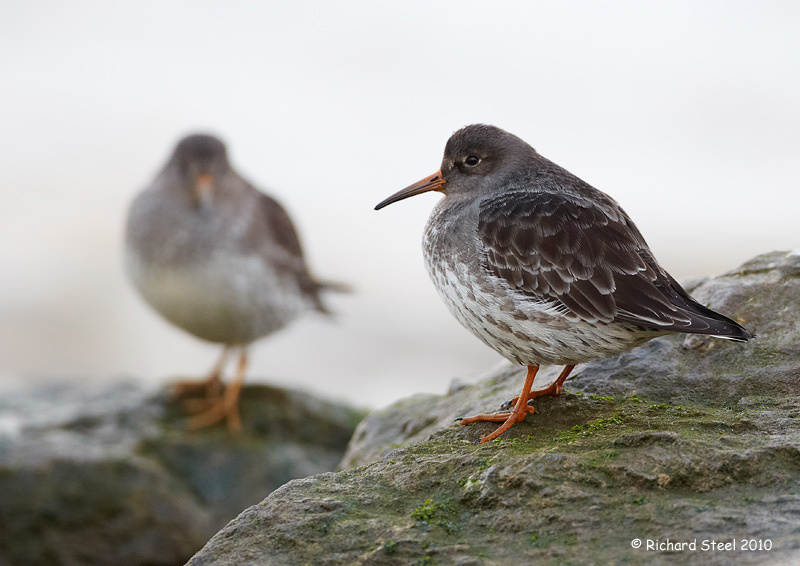 Redshanks, Oystercatcher, Dunlin, Turnstone and Grey Plover swell the numbers at the high tide roosts. I am lucky as all this is within 5 minutes of my front door. 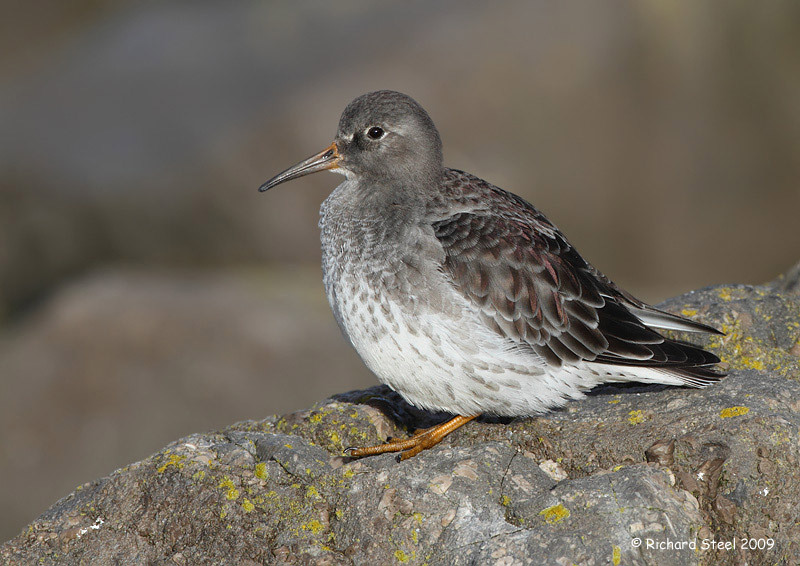 One wader species that I haven't mentioned in the list above which the local coast is well known for, is the Purple Sandpiper. 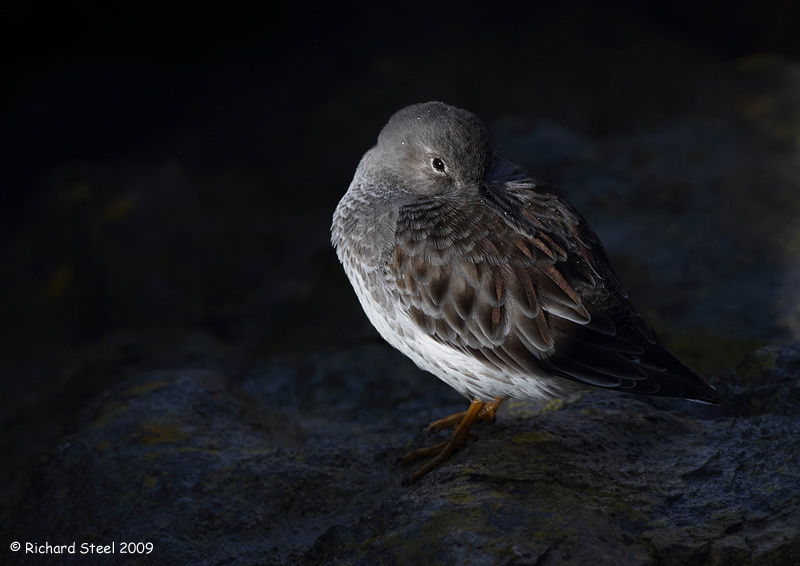 These birds can be found in their dozens on occasions during high tide periods sat on rocks that make up the local sea defences. I have always had a fascination for these birds, although my first ever sighting of one left me a little bewildered as to how they gained their name. My first ever encounter was under the common leaden skies of a UK winter and there before me was a small dark grey dumpy looking bird with orange feet and bill. The confusion was caused by, despite carefully looking at the bird, I could not see anything remotely resembling purple. I was puzzled for a couple of weeks until one day the winter sun put in a brief appearance and the subtle purple sheen of the wing feathers appeared. From a photography point of view they are relatively easy birds to photograph as they are generally quite confiding and accepting of your presence. As I can only photograph the birds at high tide roost, I always adopt a very careful approach to cause no disturbance. These roosting periods are very important in terms of the daily energetic budget of the birds. I often wish that some dog walkers would realise this at they unleash their hound amongst the resting flocks gathered on the beaches. In fact research shows that the approach of a large slobbering mutley elicits a much greater stress response in the birds, measured by blood cortisol levels, than that of a person. 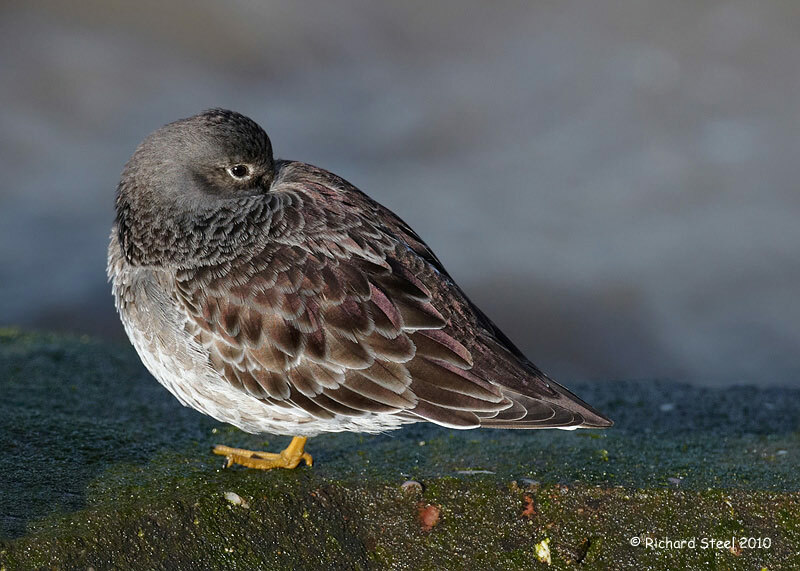 Purple Sandpipers at a roost can be quite frustrating to photograph as they seem to show the typical wader habitat of standing on one leg more than many other species. To me a photograph of an apparently one-legged bird is not always the most attractive. 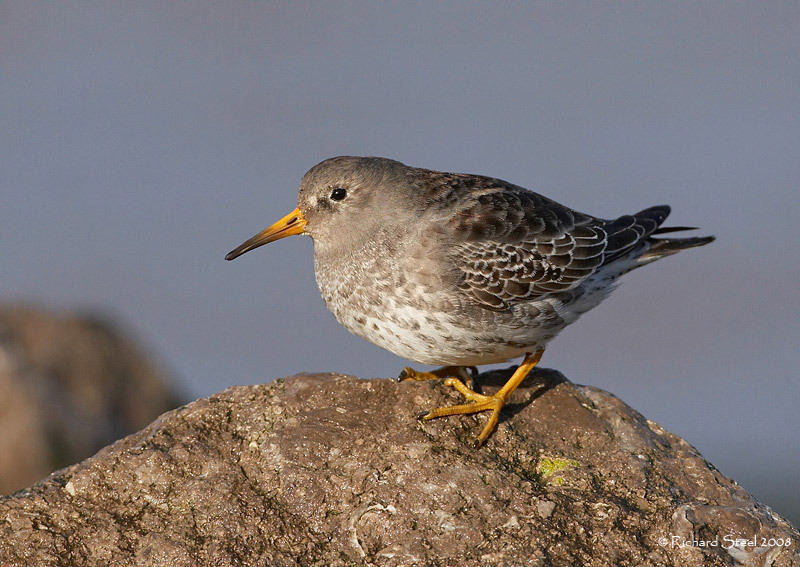 Last year my Purple Sandpiper took a sudden nose dive. The development of a large retail and leisure development on the coast around and existing marine lake include construction of a large floating pontoon. The pontoon is now packed side to side with waders during each high tide. A great refuge for the birds but that has left my traditional photography sites barren. 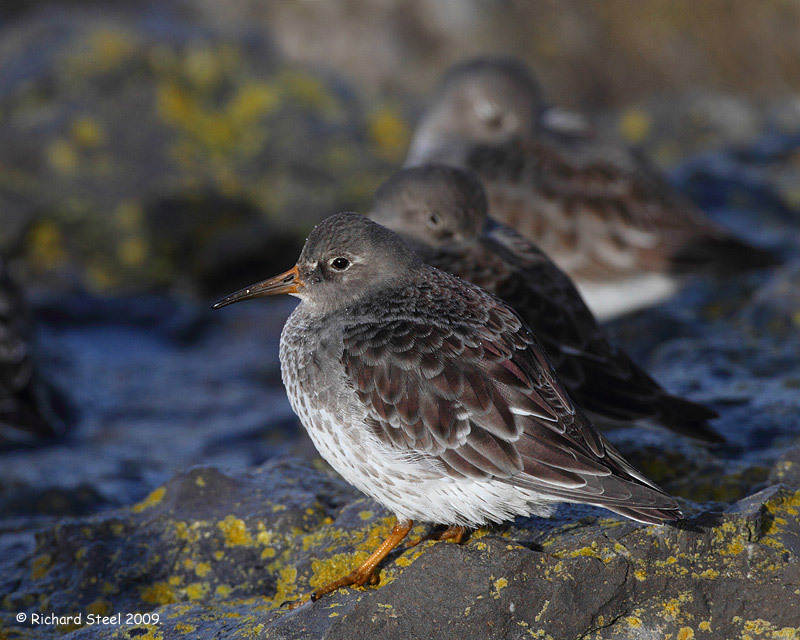 So this year to photograph Purple Sandpipers I will need to make a trek across to Hilbre Island. This is a small local island that you can walk to at low tide but for some unknown reason I have never visited. The red sandstone outcrops of the island should make an attractive settings for the birds. I am looking forward to this assuming that the rare combination of accessible tide times and good weather coincide. For my post next month I am going to take you on a bit of journey out of the UK and into the perpetual light of summer in arctic Norway. 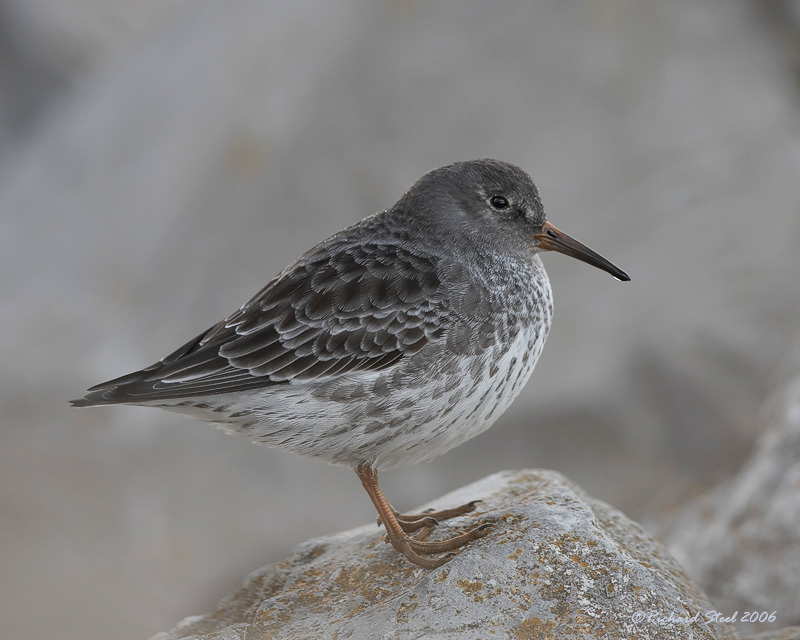 Amazing beautiful photos of winter Sandpipers, this was a beautiful bird! Enjoyed all the pictures very well. Terrific shots! You solved a mystery for me as well by showing the purple sheen on the feathers. Re dogs, it's not just that dogs chase birds away when running free, I read somewhere that their mere presence, even when on a leash, decreases bird sightings by about 40%. 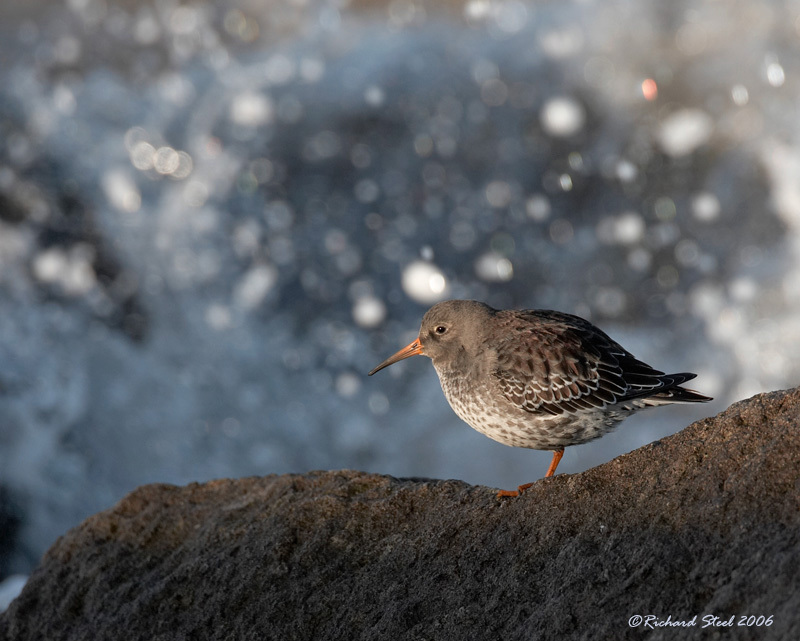 These images are gorgeous Rich and the Purple Sandpipers is a very lovely bird. 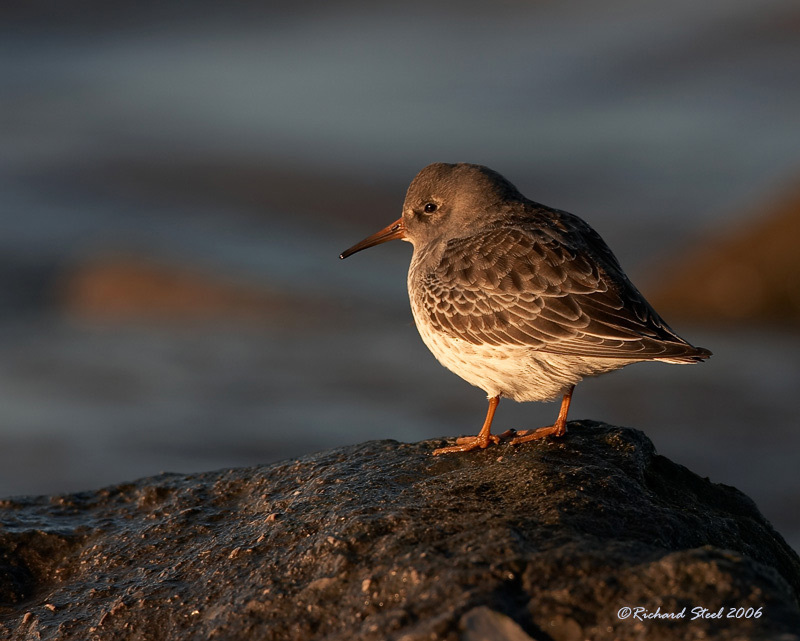 Exquisite photographs of these very beautiful sandpipers!